Is This What the Next-Gen iPod Will Look Like? Apple Preparing to Launch a Digital Camera? At first glance, the imaginary next-gen iPod (above) looks pretty much the same as its predecessor (below), except for the wider screen ratio that stretches to 1.5:1 from 1:33:1. The Click Wheel is slightly smaller and positioned a bit lower on the nano’s body, and a digital camera is placed at a seemingly awkward spot on the nano’s backside. 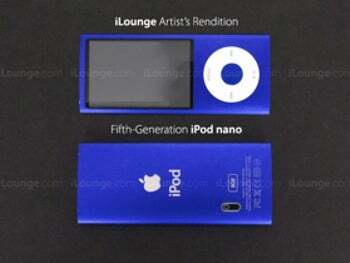 While iLounge’s mockup iPod is impressive, the camera placement does seem out of whack. Still, the marriage of iPod and digital camera is likely. Recent reports have Apple buying 3- and 5-megapixel camera CCDs from Omnivision for its embedded devices, and many sources expect to see a camera-equipped iPod later this year.